Where to start? 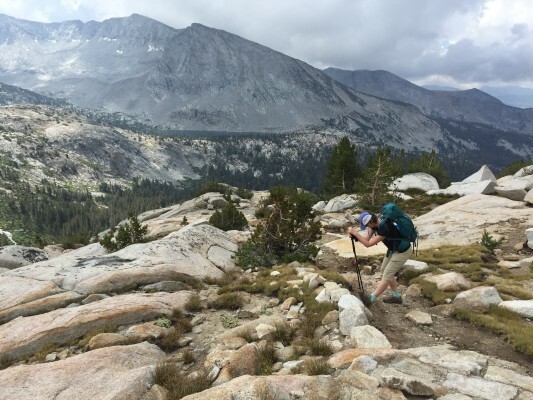 I really wasn’t going to write again this year about hiking in the High Sierra, but how could I not when what happened was so unexpected? 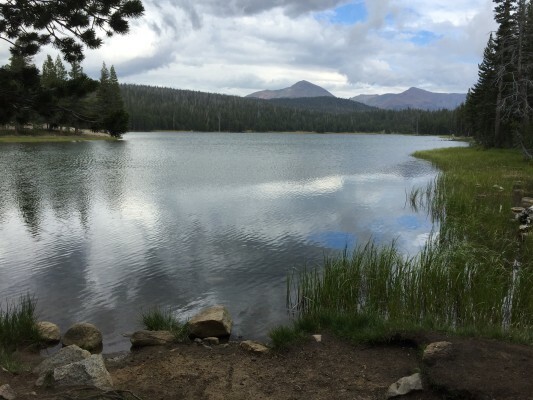 After driving from Oakland to Yosemite and taking a three mile hike to Dog Lake and back to acclimatize to the elevation, my friend and I arrived at Tuolumne Meadows Lodge just as it began to rain. More rain was predicted the following day, an 80% chance. However, when we set out early the next morning for Vogelsang, our first camp, the expansive blue sky was filled with dramatic white cumulus clouds, a beautiful day. Until the thunderheads rolled in. Fast. 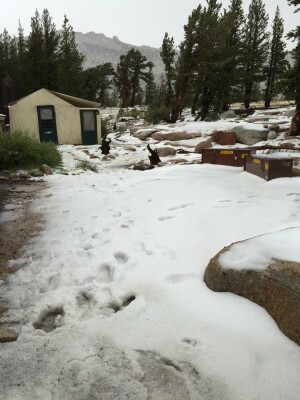 We put on our rain gear and made haste to the camp as raindrops started to fall. No sooner had we walked into the reception tent when the downpour began. First heavy rain, then pea-sized hail. Lots of it. Pools of water flooded the tent floor, dripped from the roof. The noise was deafening; we couldn’t hear each other speak. Outside the door, four inches of hail accumulated and stuck. Perhaps the next day would be different. But this was not to be. Although the weather was initially fair, it quickly became evident that we were in for more precipitation. The sky grew dark and glowering. We donned our rain gear once again and just in time. But being pelted with rain and hail was not what distinguished this hike from any other. What set this one apart was the amount of water surging down the mountains, engorging the once quiet creeks that crossed and recrossed the trail. And we had to cross these now swollen creeks again and again! Each time we came to a crossing, we had to examine the possibilities and find the least dangerous alternative. At the widest and most treacherous spot, the choices were bad and worse. My friend decided the best option was to walk across on a fallen tree that connected both banks. The distance between the banks was about twenty feet, the tree at least ten feet above the raging waters below. I thought this was a terrible idea and beseeched her not to do this. I couldn’t imagine even watching her do it and she wisely decided against it. We finally crossed on submerged rocks and parts of fallen trees, the water rushing over and around our feet, my heart in my mouth the entire time. We arrived at Merced Lake camp cold, tired and wet. What would the upcoming day bring? Sunshine. Cool breezes. 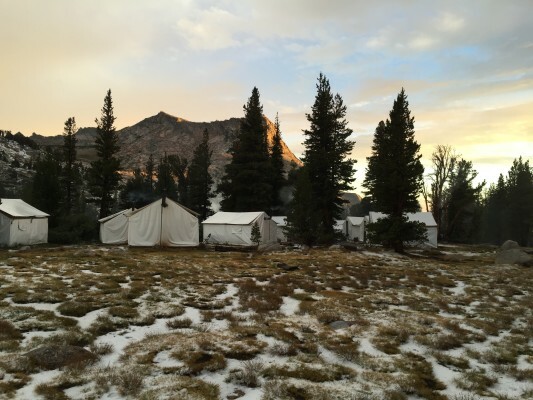 Fine weather brought us to Sunrise camp where the temperature was cold but our hike and our stay were remarkably free of any adversity or drama. Conditions were likewise favorable for our hike back to Tuolumne Meadows on our last day. The morning light was soft, the air filled with the musical sounds of song birds and the tinkling of the now tranquil creeks. Still, what I will long remember is the tumult of the storm and the thrill of this adventure.